My name is Alen and I am from Sarajevo, Bosnia and Herzegovina. 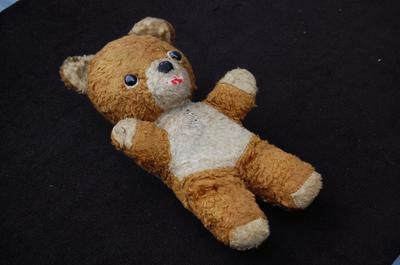 My dad found this teddy bear alongside other items that were not related to bear (ruller, lp records and coins). Bear has red lips and it seems he is smiling. On touch he is stiffed, hard. His arms and legs are not really movable (no rotating, incuding arms, hands and head. His heigh is 26cm or 10.24". Unfortunately, there is no tag on him. There is some sewing on his belly and neck (could be repair or at least it seems as repair to me). The colour is brown and white. Nose is sewed (it's not button, while his eyes are like two buttons). I would like to know which company made this fella and which year or at least approx. in which decade he is made (it seems old to me). Also, in this condition what would be his value. Sorry for my English and thank you for any info. Did you find out the value? My daughter has that bear! 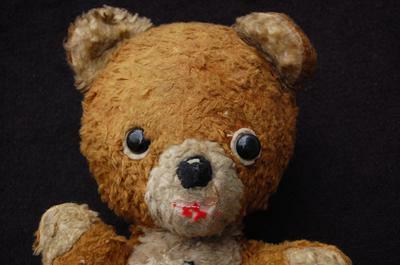 It was my first teddy,Did you find out the value? Couldn't find any pictures, czech internet is extremely unhelpful. The year is just rough estimate, he might have gotten the bear few years later, but he had him his whole childhood. Looks Like a 1960's - 1970's teddy bear to me. the way the legs and arms are joined to the bear is a giveaway. 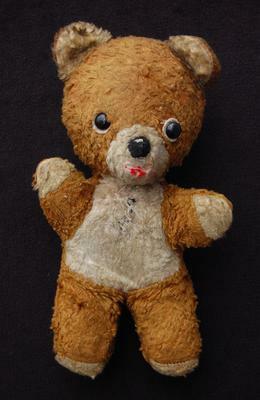 the trouble is there were many teddy bear makers during that time, so it can be difficult to identify the bears maker.